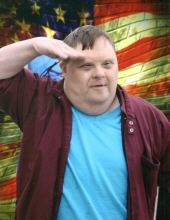 Anthony Scott "Scotty" Francis, age 53, of Mousie, KY, passed away Friday, April 5, 2019, at the Knott Co. Health and Rehabilitation Center at Hindman, KY. He was born in Fort Wayne, Indiana on September 15, 1965 to Donald D. Francis and Jean Huff Francis. Funeral services for Anthony Scott "Scotty" Francis will be held at the Hindman Funeral Services Chapel, Monday, April 8, 2019 at 1:00PM with Clyde "Bud" Wicker Jr., Glenn Noe and Lawrence Baldridge officiating. Burial will follow at the Davidson Memorial Gardens at Ivel, KY. Visitation will be held at the Chapel, Saturday evening after 6PM and anytime Sunday with additional services Sunday evening at 7PM. In lieu of flowers memorials may be made to: Knott County Central Special Olympics Team 76 Patriot Lane Hindman, KY 41822.
with Clyde "Bud" Wicker Jr., Glenn Noe and Lawrence Baldridge officiating. "Email Address" would like to share the life celebration of Anthony Scott "Scotty" Francis. Click on the "link" to go to share a favorite memory or leave a condolence message for the family.